Brett, Troggg and Flossy made the front page of the Buderim Chronicle – Thursday, April 27, 2017. 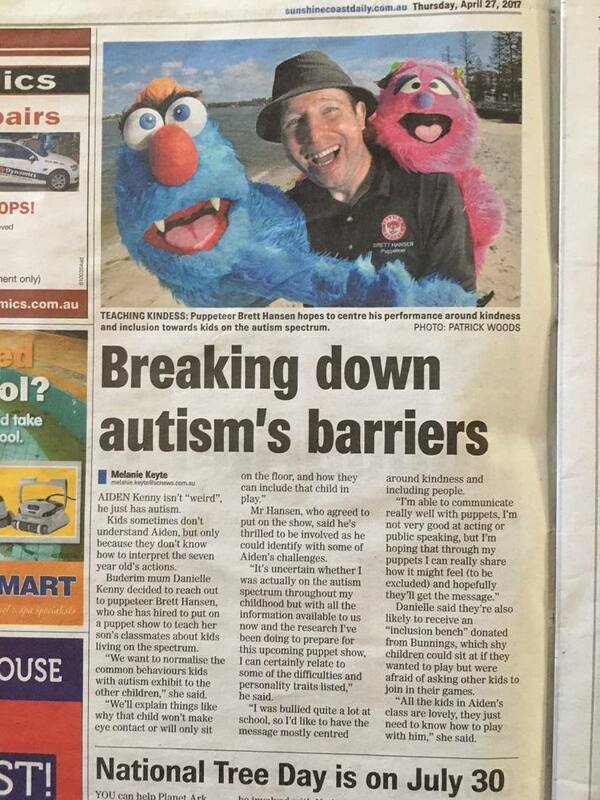 The article was later published online at the Sunshine Coast Daily website. AIDEN Kenny isn’t “weird”, he just has autism. Kids sometimes don’t understand Aiden, but only because they don’t know how to interpret the 7-year-old’s actions. 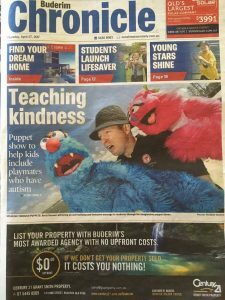 TEACHING KINDESS: Puppeteer Brett Hansen hopes to centre his performance around kindness and inclusion towards kids on the autism spectrum. 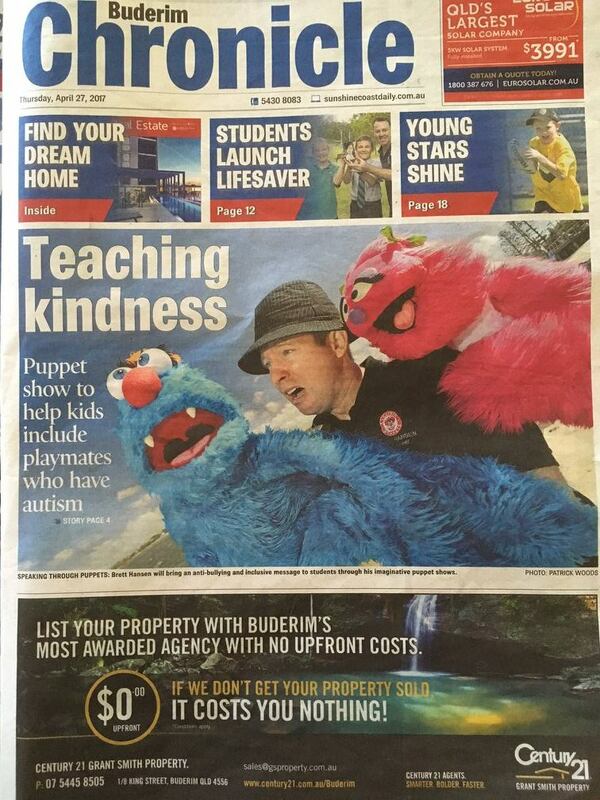 Photo by Patrick Woods (Sunshine Coast Daily). 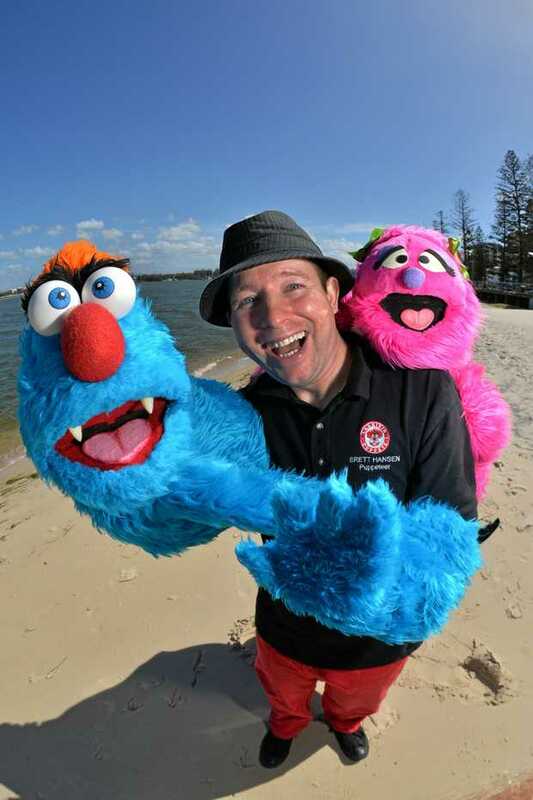 Buderim mum Danielle Kenny decided to reach out to puppeteer Brett Hansen, who she has hired to put on a puppet show to teach her son’s Maroochydore State School classmates about living on the spectrum. Mr Hansen, who agreed to put on the show, said he was thrilled to be involved as he could identify with some of Aiden’s challenges. 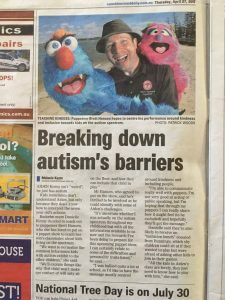 “It’s uncertain whether I was actually on the autism spectrum throughout my childhood but with all the information available to us now and the research I’ve been doing to prepare for this upcoming puppet show, I can certainly relate to some of the difficulties and personality traits listed,” he said. “I was bullied quite a lot at school, so I’d like to have the message mostly centred around kindness and including people. Danielle said they’re also likely to receive an “inclusion bench” donated from Bunnings, which shy children could sit at if they wanted to play but were afraid of asking other kids to join in their games. “All the kids in Aiden’s class are lovely, they just need to know how to play with him,” she said.